The last few minutes of our fasts feel like the slowest. So much of the last ten minutes of each fast is spent watching the clock, impatiently awaiting each tick as time crawls to the moment where we can eat our mouth-watering food. The time for Fajr is just as important as the Iftar time. We have to know what time we have to stop eating to start our fast. The importance of time in this month makes this the perfect opportunity to help our children practice their analog time-telling skills. 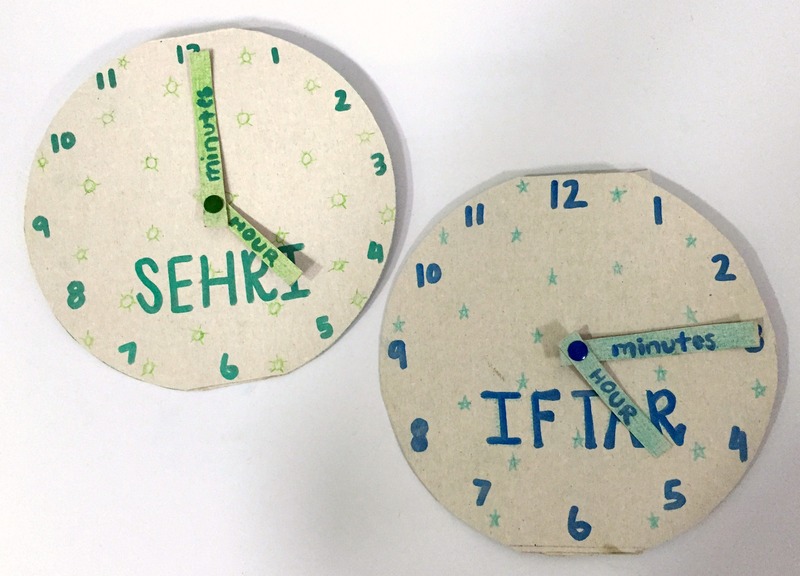 I created these sehri and iftar clocks using a cereal box, cut into two circles and four long skinny rectangles for the hands of the clock. All you have to do is write the numbers on the face of the clock and attach the hands using a brad or a pushpin. Decorate the clocks as you like. If your child is just learning how to tell time, you can write “hour” and “minute” on the hands of the clock to help them out. You can attach a magnet on the back to hang it on the fridge, or you can use the pushpin to secure it to the wall. Every day, you can give your child the task of setting the time on the clock to the proper time of Fajr or Iftar. You can use the clocks to help your child feel a little bit of ownership of the time and also help them figure out for themselves how long they have left of their fast.